"Give up chocolate and candy bars?" 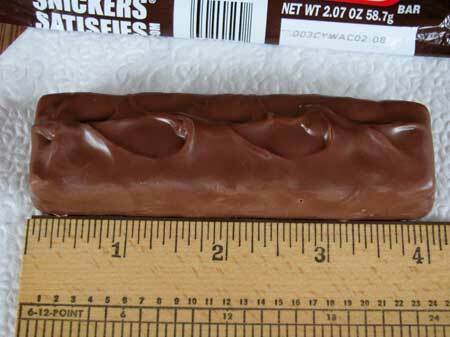 Snickers candy bar, an American favorite. Many of the "best" weight loss plans advise giving up chocolate totally. A 25% portion reduction is like giving a friend a bite of your candy bar. How hard is that? Eat 75% of a Snickers, give the rest to a friend. If you're like most people, you won't miss it. Remember, reduce portion sizes 25% and you reduce calories, fat and sodium 25% as well. How many diets have ended because the chocolate cravings were too strong to overcome? If you're like me, life without chocolate is no option. Besides, research has proven many health benefits of chocolate. What makes chocolate bad is the fat content and portion size. 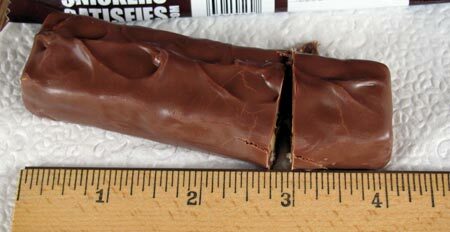 If you normally eat a candy bar everyday and make this portion reduction for a year, you lose 7 pounds in a year with no other exercise or diet changes. A York Peppermint Pattie has half the calories of a Snickers. Save 140 calories and lose 14 pounds in a year by replacing a daily Snickers bar with a Peppermint Pattie. Eliminate a Snickers from your diet everyday and lose 29 pounds in a year. BETTER than adding a candy bar to your diet everyday and gaining 29 pounds! Go to PORTION SIZE PROBLEMS and leave SNICKERS CANDY BAR.